It was a great honor to have Ambassador Henne Schuwer from the Kingdom of the Netherlands to the Fort Germanna Visitor Center on Saturday, March 24, 2018. Germanna Foundation President Marc Wheat welcomed him and gave him a tour of the visitor center/museum/library. Germanna has a deep and unusual connection with the Kingdom of the Netherlands: the colonists who settled at Germanna in 1714 were originally from the area around Siegen, ruled by a branch of the Orange-Nassau family which now reigns in the Netherlands. A member of that family, Johan Maurits of Nassau-Siegen, donated a communion chalice to the parish of Oberfischbach emblazoned with his coat of arms to celebrate his elevation to the position of Herrenmeister of the Johanniterorden (Grand Master of the Order of St. John) in 1665. That chalice was used to administer communion by Rev. Henrich Haeger, who emigrated with members of his congregation in Oberfischbach to Germanna. 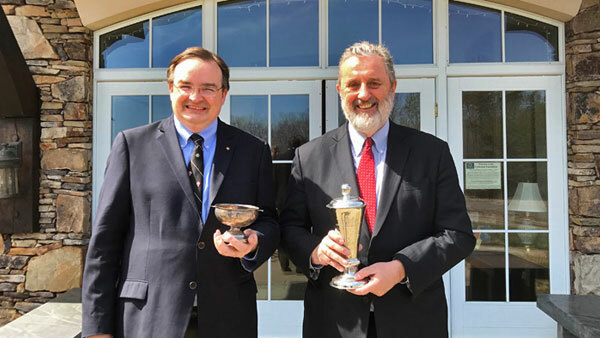 In 2016, the North American Delegate of the Johanniter Order to the USA Rainer Koehler presented a museum-quality reproduction of that chalice to the Germanna Foundation. Rainer Koehler and Scott MacMillan (who supervised the reproduction) are expected to be present to show the Germanna chalice to Ambassador Schuwer. See this post on our website to learn about the creation of the chalice and read the presentation speech by Rainer Koehler. Orange County, Virginia is named after William of Orange, later reigning with his wife as King William III and Mary II of England, Scotland and Ireland. William of Orange and Johan Maurits of Nassau-Siegen were cousins through their descent from William I the Rich of Nassau-Dillenburg (1487-1559). At the death of William III, Johan Willem Friso of Orange-Nassau succeeded to the title of Prince of Orange. Friso is the ancestor of King Willem-Alexander of the Netherlands, Queen Elizabeth II of the United Kingdom, and is the most recent common ancestor of all European monarchs occupying the throne today. Germanna Foundation Marc Wheat (on the left) welcomes Dutch Ambassador Henne Schuwer (on the right) to the Fort Germanna Visitor Center.